At ALA a few months ago I ended up in a conversation with Galen Warden from Tutor.com. I told her we had been writing a sequence about online homework help, and she asked if she could sponsor it. If you think about it, that's kind of brave. They were asking to pay to sponsor, sight unseen, a sequence of strips essentially roasting their product and the people who use it. We admire that kind of chutzpah, so we said yes. Anyway, since we wrote that sequence we've learned a lot more about Tutor.com. Live since 2000, they now connect thousands of human tutors to millions of students around the country. This service is made available free to students via over 1800 library branches. A great way to find out about them is to register for their April 22 online conference thingy (I do so hate the word "webinar") here. Tell 'em we sent you. P.S. 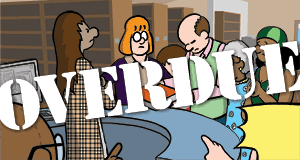 Due to an amusing scheduling problem you can see a thumbnail of tomorrow's Unshelved strip on their website today. It's like seeing the future. But smaller. We've added three more talks to our already-full-to-bursting 2008 calendar. On June 13th we'll be addressing the Navy & Air Force librarians at Tacoma's McChord Air Force Base, a rare summer talk. Farther from home, on Friday, November 7 we'll be speaking at the President's Luncheon at the Wisconsin Library Association in Middleton, WI. Then we'll make our way to Indianapolis for the Indianapolis-Marion County Public Library Staff Day on Tuesday, November 11th. In between we'll probably hang out in Chicago with, you know, Chicago people. Our home page has our full, up-to-date schedule of appearances. Check it out! by Judy Kent, who also works for a library system in the northwest.